This section looks at the general principles of office layout, workstation design, seating, desks, workbenches and storage systems. Consideration is also given to health and safety issues related to technological changes in office equipment and tools. An important feature of modern office design is the need for flexibility in office layout, furniture, equipment and the environment to suit the needs of the users and the work they perform. Design must be taken into account in the early stages, not just when a building is being outfitted. See Victorian WorkCover Authority’s Designing Safer Buildings and Structures: a Guide to Section 28 of the Occupational Health and Safety Act 2004.
tertiary space – space required in a workstation to accommodate a desk, chair, drawers, filing cabinet and other necessary equipment. The Building Block approach is one method used to determine the amount of space required by personnel. This is based upon a functional analysis of their needs, that is the tasks they perform in their jobs. This method recommends a minimum of 6 square metres per person for tertiary space and additional space for secondary and primary space requirements. It enables planners to provide enough space for all the requirements of technical people working in offices including clerical and administrative staff. AS 1668.2 (2002) recommends an overall 10 square metres per person for offices, including primary, secondary and tertiary spaces. This standard relates to the ventilation of the building. The important thing to design for in all circumstances is the functional needs of the employee. Generally carpet is preferred in office areas to provide a comfortable walking surface and to reduce noise, reflected light from polished floor surfaces and the risk of slips and falls. Selection of wool mix carpets reduces the build-up of static electricity which can give a mild electric shock. Carpets should be properly laid without loose edges or ripples and should be well maintained. Where there are tasks requiring pushing and pulling wheeled equipment, carpet should be low profile to prevent high force manual handling. Walkways should provide safe access and egress at all times. The use of walkways for temporary storage can introduce tripping or falling hazards and block emergency exits. The through traffic using walkways can be a source of noise and distraction for staff positioned near them. Walkways near office workstations should be bordered by sound absorbing panelling to help reduce noise. Partitions are used to divide workstations and provide visual and auditory privacy. They can also reduce unwanted distractions, provide a background visual surface for computer screens, reduce contrasting light intensities, help direct a person’s line of sight towards an external window for relief of visual fatigue, and control external and reflected light. Partitioning can cast shadows and reduce levels of light if not appropriately designed or installed. Refer to Section 3 for additional information. Storage facilities such as filing cabinets, lockers and shelves often sit on the border of a walkway. When choosing the location of this equipment it is important to consider what other activities occur in the area. For example, a filing cabinet requires approximately 1.2 metres of space in front of it to enable someone to access a fully opened bottom drawer. If this projects into a frequently used walkway it becomes an obstruction and a hazard will be created. The size and layout of a work area should accommodate the equipment and the needs of the users. Where equipment such as photocopiers, faxes and printers are used, there is a need to accommodate the equipment and allow for additional traffic and general activity. A separate space, with access to hot water and a sink, should be provided for meal and tea breaks and to allow employees to take rest breaks away from their work desks. The core components of an office workstation include a desk, a chair and the equipment used to perform office tasks. Other furniture may include reception desks, paper storage, collation benches and workbenches next to office equipment such as photocopiers, faxes and printers. In the design of office workstations flexibility and adjustability are the key design issues. Individuals can then control how their workstation is set up and organised to meet the changing demands and variety of tasks they perform. The design of a workstation should be directed by the range of people who may use it, the tasks they perform and the type of equipment to be accommodated. In addition to adjustability to accommodate the different sizes and statures of people, workstations need to be flexible and large enough to accommodate the growing range of tasks performed and equipment used in offices. The workstation should be easily adjustable and the adjustment mechanism should not create a risk from manual handling. Electric adjustment is the most appropriate. The shape and adjustability of a workstation influences the postures people adopt while working. The location and type of equipment used at the workstation also influences the range of movements performed during work. The workstation then is the means of placing people in the best position to enable them to effectively perform their tasks and use their equipment in comfort. casual users – using computers on an occasional basis or infrequently during the day. Workstations should also allow for non-computer tasks, or separate workstations should be available for non-computer work. single-user workstations need to be adjusted initially to meet the particular dimensions and preferences of the individual. Even after this initial adjustment, the user’s tasks or needs may change requiring further workstation adjustments. Possibly the most common workstation found in the office combines provision for computing and general administrative duties. This workstation usually involves an adjustable chair, a desk, a footrest if needed, desktop computing equipment including a keyboard, a mouse, a hard disk drive and a screen, a document holder, a telephone, and related furniture and equipment. As new technologies and tools are introduced, flexible workstations are required to accommodate the job design changes that occur as a result (see Figure 5.1). It is essential that office seating is comfortable, appropriate to the task being undertaken and easy for the operator to adjust. The often held view of the activity of sitting is that people maintain a fixed posture for long periods of time, however, when performing a range of activities, people tend to adopt different positions and postures while seated. This is desirable as it provides variation in loading of the thighs and back and in general can improve seating comfort. armrests are optional; they help decrease the forces on the shoulders and back during rest from keying. If provided, armrests should preferably be adjustable in height. In general, chairs are designed to fit 90% to 95% of the adult population. People outside this range, because they are tall, short or large, may need seating that is tailored to their needs. Chairs should support the body in a way which minimises awkward postures and provides comfort, however, chair positions may need to be changed often. No chair can provide a perfect position for long periods and it is important to change postures and get up from a chair many times during the day’s work. executive chairs, which, as the name suggests, are designed as status furniture for executives; their design often provides little in the way of adjustability and seat and backrest design to give support; as most senior managers use computer equipment as a core part of their daily work, executive chairs should include the adjustability and other features listed above. adjustability to meet the range of different sizes of the users. Refer to the WorkSafe Australia publication Ergonomic Principles and Checklists for the Selection of Office Furniture and Equipment (1991) and AS/NZS 4443 Office Panel Systems – Workstations (1997) for more detailed information on office desks and workstations. These desks are designed to raise and lower the desk surface so that the user can position work at the most comfortable height. They are suitable where different staff use the same desk (multi-user) or where a range of different tasks are performed at the same desk (multi-task). The length and depth of the desk depends on its use. For example, a computer screen needs to be located at least an arm’s length from the user when sitting in a keying position and the depth of the desk will need to take into account the depth of the screen and the distance required from the user. Where a freestanding desk is used against a wall, it may have to be moved away from the wall to allow the screen to be placed at the rear of the desk and to achieve a suitable distance from the user. These desks provide limited flexibility for the user. Chair adjustments are relied on to meet the user and task requirements. In some situations the desk can be modified (raised or lowered permanently) by a trades person; however, this renders the desk unsuitable for use by people of different physical dimensions. Some desks used for computing work have an adjustable section to hold a keyboard. These designs limit the range of tasks that can be performed at these desks. If they are used, the selection of a split desk should match the tasks that need to be performed. Adjustment mechanisms located in the leg space under the desk may be hazardous to the knees. A drop down keyboard shelf provides inadequate space for using a mouse, forcing the operator to raise the arm up from the side to use the mouse. Keyboard platforms that slide out from under the desk are not recommended as they cause an increase in the reach distance to other equipment on the desk and generally provide inadequate space for the use of a mouse. In these workstations, the desk is usually designed to extend along two sides of the partitioning so that it occupies the corner. The corner section usually has a bridging section that is at 45 degrees to the two sides. In some cases the bridging section connects the two sides with a curve to accommodate larger computers, which can be placed in the corner section to take advantage of the increased depth created by the angle. Placement of these larger computers, such as some design and engineering systems, is crucial as they are much deeper than conventional screens and, if placed on one of the side sections of the desk, would be too close to the user. Corner workstations can be an efficient use of space and often have built-in cable housing. Care should be taken to choose a workstation that does not impose limitations on adjustability or the ability to choose a layout if needs change. Typical tasks that require a standing-height bench include sorting mail, collating and binding documents, and receiving incoming goods. 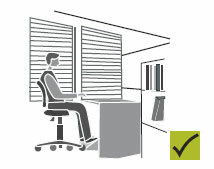 In some cases, standing-height benches or drafting workstations are used by staff whose capacity to sit for prolonged periods is limited (Fig 5.4 and 5.5). Ideally, standing-height benches should be adjustable to accommodate the height differences of the range of people using them. In general, a standing-height bench needs to be between 850 mm and 950 mm from the floor, but this will depend on the type of task performed. Some desk designs incorporate a sloped surface section. Otherwise an angle or sloped board enables the angle of a work surface to be adjusted. It is usually placed on top of a desk and used to raise the height and angle of documents so that the neck is in a more upright posture while reading and writing for prolonged periods (see Figure 5.6). Eye strain can be decreased by positioning the document at a right-angle to the line of vision. The angle board needs to be adjustable and large enough to support several documents. adjustability to fit most users (AS/NZS 4442 Office Desks – 1997 recommends a range of adjustment for seated tasks of at least 150mm, from 610mm to 760mm in height, easily adjustable from the seated position). Where possible, split desk designs should be avoided as these limit the options for placing equipment and can cause secondary hazards if the user’s legs strike the adjustment mechanism. The space under the desk should be free of obstacles to enable safe and comfortable location and movement of the legs. Where possible, arrange trials of a variety of desks from suppliers. This allows you to select desks suitable for the variety of tasks performed at each workstation. Consider modular workstations that permit flexibility in design and layout. The layout of equipment and resources on a desk should be arranged so that they are within reach. Their proximity to the user should be prioritised according to the nature or the item and how it is used. The desktop can be broken up into three broad sectors according to the capacity of the seated individual to reach to each sector (Fig 5.7). The optimum reach sector is where the hands operate for most of the time. Equipment is usually brought into and out of this area as different tasks are performed. For example, when a typing task is finished the keyboard is moved to one side to make room for a writing activity, or the chair is moved to a different part of the desk so the hands can function close to the body. Frequently used items, such as the keyboard, mouse or telephone, should be used in the optimum reach sector. The maximum reach sector involves an area that extends beyond optimum reach where, using the shoulder and arm, the user can reach with comfort. This sector should be where the hands retrieve and deposit equipment and materials on an intermittent basis. Reference manuals are an example of what can be kept in the maximum forward reach zone, but not in a high reach zone, where excessive force may be required to lift them down. 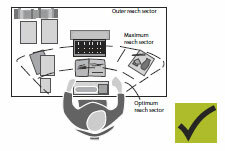 The outer reach sector involves extended reach where bending forward and even rising from the chair gains extra distance to reach an item. This area is usually only suitable for occasional reaches. Where possible, layout should be reorganised to bring frequently used objects closer to the user. Alternatively, work can be relocated altogether to another desk or bench for better access. Locating rarely used items out of reach, requiring the user to get up from the chair, may encourage changes of posture. These trays can usually be placed in the maximum reach zone and stacked on top of one another or placed side by side. Placing the trays closer to the operator helps improve posture and movements by limiting the need for extreme reaching. Reading source documents resting on the surface of the desk for prolonged periods may cause neck and shoulder strains through the adoption of poor posture. 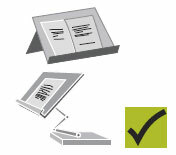 Document holders are designed to hold reference material so that they can be positioned according to the visual needs of the user (Fig 5.8). Upright movable document holders can be positioned next to the screen at the same height and visual distance from the user as the screen. A-frame or flat document holders can be positioned between the screen and keyboard to support multiple or bulky papers. A-frames need sufficient adjustment to raise, lower and angle documents to accommodate different screen heights. Screens may need to be raised above desk height to reduce postural strain to the user’s neck muscles. The top of the screen should generally be level with the user’s horizontal eye level and at a distance of approximately one full arm length when the operator is sitting in their usual position for keying. A variety of stands are available to raise screens above desk height. Fixed-height stands tend to be suitable for single user workstations where the height of the monitor suits the individual’s needs and the employee performs varied tasks, including keying, throughout the day. Adjustable height and movable stands can be used to meet the needs of a variety of users or to provide space for other tasks an individual may perform over the day. Wrist or forearm rests are incorporated in some keyboard designs or provided to support the forearm during pauses in keying work. In practice, however, people often use the rest while typing, causing the fingers to reach to the keys rather than the whole arm generating that movement. This may cause strain of the muscles and tendons at the wrist. The use of a wrist rest also places the keyboard further away from the user, which can increase sustained load on the shoulders and cause discomfort or muscular strain. People in offices use telephones to varying degrees. Telephones should be situated so that the user can perform simple tasks, such as taking notes, without the need to twist or support the telephone on the shoulder. A long enough cord is usually sufficient to allow flexible positioning of the telephone to suit the user. Headsets should be used where the person has to regularly perform tasks such as keying information or taking orders while using the telephone, or does dedicated telephone work, such as in a call centre. Use of a headset can assist in reducing the reach distance and the frequency of handling the receiver and eliminate awkward neck postures. When a headset is being purchased, the surrounding environment and the need for the user to attend to other signals should be considered when deciding on the design and number of ear pieces. A hands-free phone may be used for occasions such as a teleconference, but they are not suitable in an open office environment. Mobile phones are common for both office work and home use. Safety hazards, such as loss of concentration leading to accidents, arise when people try to perform additional activities at the same time as using a mobile phone, for example while driving. Noise in the office caused by ringing phones should be controlled by a policy of reducing volumes of phones in the workplace. MP3 players are frequently used in the workplace as a means of cutting out background noise such as the conversations of co-workers. Employers have also identified the potential for MP3s to be utilized in the provision of induction training for new employees. Rather than new employees spending their first days in the organisation attending induction training, employees can refer to the relevant module on their MP3 as they encounter a particular issue. Audiologists have raised concerns regarding hearing loss due to MP3s, factors which increase hearing loss in MP3 users are the ear buds used with MP3s which boost the sound signal by 6 to 9 decibels as the music is delivered directly into the ear canal. Also most MP3s have a maximum volume of 115 decibels; at this level hearing loss can occur in just 28 seconds per day. Risk of hearing damage is increased by many people who increase the volume on their MP3 to drown out background noise such as co-workers’ conversations, or sounds of traffic on their way to and from work. In the office occasional MP3 use can be positive as employees are able to concentrate on work without the distraction of background office conversation. However, listening to an MP3 may pose a risk for employees in the construction industry, or forklift truck drivers, as the MP3 may decrease their awareness of external events. This may be detrimental in situations where the employee is surrounded by moving people and objects. Also an employee listening to an MP3 at high volumes may not hear emergency warnings (for example, a fire alarm or a co-worker’s warning shout). The risks of hearing damage can be reduced by limiting the amount of time spent listening to the MP3. Researchers recommend that people use their MP3 for just 60 minutes a day on 60 percent(%) of maximum volume. Hearing damage may also be avoided by using headphones which eliminate background noise so that music can be listened to at a lower volume. Manual equipment such as staplers, hole punches and letter openers may place undue pressure on the hands and wrists. Electrical staplers and mechanical letter openers can reduce manual strain for activities which occur frequently or over a sustained period of time. Manual strain may also be reduced by selecting appropriate equipment for the task, for example choosing a hole punch with a longer lever for thicker documents. Manual stressing may also be avoided by alternating tasks so that equipment is used for short intermittent periods. Laptop computers were designed for short-term or mobile use. The portable nature of the laptop and notebook results in them being used in a wide variety of situations and settings where there is limited capacity to adjust the desk. This can result in the work height being unsuitable. Lack of adjustability of the screen and keyboard can result in the arms being held too high or the neck bent to view the screen. If this position is adopted frequently or for long periods, discomfort may result. If the screen is tilted upwards to reduce the need to bend the neck to view the screen, reflections can be a problem with some screens. becoming keyboard literate to avoid periods of time looking down at the keys, which can contribute to neck discomfort. The portable nature of these computers also means that they are frequently used where there is no suitable or adjustable workstation, for example, sitting the computer on the lap or on a kitchen table or using the computer in a cafe or motel. Prolonged use may contribute to discomfort. Carrying laptop computers may also contribute to back and neck problems. The introduction of laptop computers to school children from an early age, and in some cases for some hours use per day, may mean that problems with portable computers may affect employees even before they enter the workplace. Docking stations enable use of portable computers in a variety of locations without the need to continually transfer information to a desktop computer once at the office. The advantage of docking stations is the capacity to easily connect the portable computer to other peripheral devices, such as the screen and conventional size keyboard. This can improve the posture, actions and overall comfort of the user. Some office working environments may pose specific risks because of the type of work or the demands of work. Minimising risks in these environments depends on careful assessment of the effects on the people involved. Some examples are listed below. Many office jobs are in telephone call centres, often requiring long periods of time to be spent in a fixed posture. Other OHS issues include hearing problems, what is known as acoustic shock, vocal problems and stress from irate or difficult customers. The design of call centre workstations and environments is the same in principle as for general office work, but special care must be taken with the design, provision and hygiene of essential equipment such as headsets. Easily adjustable furniture and equipment is important as employees have to move from workstation to workstation both within and between shifts. Given the constrained nature of the work, issues of job design must be carefully considered. These would include introducing some variety into the work, taking adequate breaks and ‘time out’ pauses for operators. Home-based work is being used increasingly by many large organisations. In addition, many small businesses operate from the home, setting up an office in a section of the house to run the business. A home office may not have the technology available of a large office, for example, a scanner or a photocopier, and repetitive manual work may be increased. Where people work at home, lack of social contact may lead to boredom, lack of motivation and loss of involvement in the decision-making within the organisation. Balance between work at home and contact at work in a larger office setting should be considered. them with control and feedback about their work and prevent isolation. Policies and procedures should be developed to cover the occupational health and safety issues of working at home, including job design, hours of work, breaks and task variation. Further information on the psychosocial aspects of work are discussed in Section 2. Environmental issues are discussed in Section 3. General information about office workstation design and equipment is discussed elsewhere in this section. Intensive computer work can be required in circumstances such as reporting proceedings of conferences or corporate meetings, or during audits of organisations. These working environments may be poorly designed for the tasks with inappropriate furniture, lighting, noise and equipment. The work may be highly repetitive over a number of days. A policy should include provision by the host organisation of an appropriate workstation, equipment and environment or the employer should provide portable equipment, e.g. laptop stand, separate mouse and keyboard, and a trolley for equipment transport. Staff numbers should allow for regular breaks from intensive keyboard or mouse use or periods of high concentration. See Sections 2 and 3 and design issues in this section. There are many office jobs which involve interaction with customers or clients. Where work involves a variety of users and tasks, including administrative and computing activities, adjustability is required to accommodate staff. Wider bench surfaces may be required for the placement of delivery items and to improve staff security, but care should be taken to avoid the need for reception or customer service staff to have extended periods of reaching up and forward. Security features, such as screens or emergency buttons, may be required. The design of reception areas should reflect the type of work involved. Desks may need to be low to accommodate discussion and interviews, or high to separate staff from clients or customers. 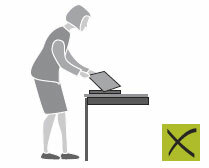 When the desk is high, thought needs to be given to whether staff need to be seated up high, possibly on a high adjustable chair with a footrest, or perhaps a false floor is required to raise the staff to the level of the customer (see Figure 5.12). The height should reflect the type of work and whether the worker is sitting, standing or both at the workstation. AS/NZS 4442 recommends the appropriate design of counter workstations. Work practices to allow variation in tasks and breaks from constrained posture and customer demands are important. Reference: Officewise: A guide to health and safety in the office (OHS 1), Comcare, with permission. Download here :: Officewise_OHS1_Apr_10.